affair. Kurt’s grandparents bought the first 40 acres in 1964, Kurt and his brother later bought 52 acres, and Kurt and Gloria bought 40 acres, all adjacent to one another, making a contiguous 132 acres today. Gloria loves their woodlands for the space it provides for their family. When their son, nieces and nephews were young they planted many acres of trees in their woodlands, and Kurt and Gloria were able to watch the kids grow up alongside those trees. Even when their son, Jake, was too young to entertain the concept of being quiet while in the woods, Kurt wanted to start instilling in him an appreciation for the woodlands and wildlife, and so he took up trapping when their son was 3 or 4 years old. Jake also got to help out in the woodlands alongside his grandpa planting trees on the property. Today, family still takes advantage of the retreat the Schuh’s land provides. Jake is involved in his parents woodlands, planting trees, going hunting there, and most recently getting two bucks in 2015. Nieces and nephews visiting in the summer enjoy time fishing and swimming in the pond, and Kurt spends time teaching them about the trees. “They dont have that opportunity anywhere else,” says Gloria. Kurt and Gloria both love the beauty of their woodlands and watching the trees grow. Kurt believes in working to improve the land, leaving it better than it was found. They believe wholeheartedly in that “we do not inherit this Earth from previous generations, but we borrow it from our children.” Kurt has planted white pines, spruces, red pine, and most recently over 200 white oaks in their property. Kurt was involved in forming the Phoenix Falls chapter, and he just finished his term as president in 2015, now serving as past-president. 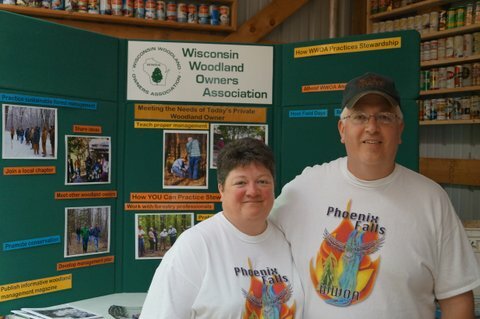 The Phoenix Falls chapter covers Florence, Marinette, Menominee, and Oconto counties. Kurt recommends that new WWOA members get involved early, go to field days and other chapter events and host field days on your own land. Kurt’s favorite WWOA activity is chapter field days. Kurt says that state hosted field days are good opportunities too, but field days in your own area allow you to see some familiar faces and woodlands similar to your own.